ca 500 - 495 B.C. 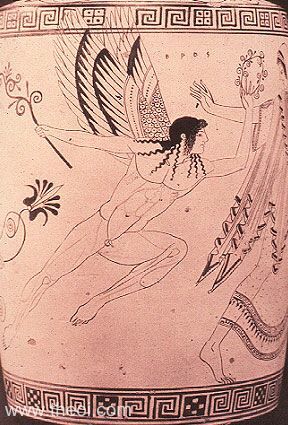 Eros, the winged god of love, flies after the maiden Atalanta in the race of the suitors. He holds a wreath of myrtle in one hand and a flowering frond in the other. Two more Erotes (not shown) follow behind the first.